Eggs are a breakfast staple around the world. Here's how to make eggs 3 diffferent ways using the Saladmaster method without using any oil or butter. Perfect for breakfast, brunch, lunch or as a snack! Preheat skillet for 3 minutes over medium-low heat (approximately 250°). Break desired number of eggs open in the bowl. Add water and whisk together until thoroughly blended. Pour egg mixture in the skillet. Using the edge of the turner, push the eggs around in the skillet and cook approximately 3 minutes until there is no liquid remaining, or to desired texture. Note: Adding water to the eggs prior to cooking make the eggs fluffy and light. Cooking time may vary depending on the number of eggs cooking. All stoves vary in cooking, so finding the right temperature setting on your stove will make a difference in how easy eggs are to cook and the utensil is to clean. Fill pan with 5 eggs. Add 2 tablespoons of water to the pan, and cover. Place on burner and set temperature to medium. When Vapo-Valve™ begins to click, turn temperature to low setting. After Vapo-Valve has activated cook eggs for 5 - 6 for medium cooked center and 7 – 9 minutes for hard cooked center. Cooking time may vary with stove. By adding a little water to the pan helps the Vapo-Valve to activate when the inside cooking temperature reaches approximately 180 degrees, and signals it’s time to turn the temperature to low setting for the remaining cooking time. Note: All stoves vary in cooking temperatures, so finding the right temperature setting on your stove will make a difference in how easy eggs are to cook and the utensil is to clean. Place griddle on burner and preheat over medium-low heat for 3 minutes. Crack egg over griddle. 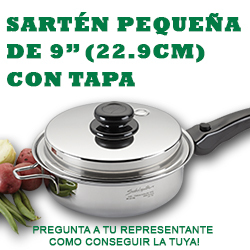 Place a medium size cover (2 – 3 quart cover) over egg and cook for 2 minutes. Uncover and loosen the edges of egg with turner. Quickly slide turner under the entire egg and flip to cook other side. Cover and cook for 1-minute. Note: Make sure griddle is thoroughly cleaned with Saladmaster Stainless Steel Cleaner and warm soapy water, rinsed and then dried to remove previous proteins or food residue that may remain on the griddle prior to cooking. Protein buildup appears as a white residue. Using a turner with a sharp beveled edge allows for ease in turning. All stoves vary in cooking, so finding the right temperature setting on your stove will make a difference in how easy eggs are to cook and the utensil is to clean.